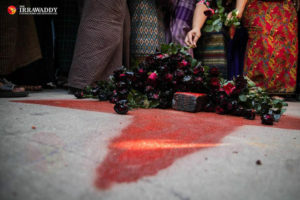 RANGOON / LETPADAN, Pegu Division — A sense of jubilation on Tuesday morning gradually gave way to fear and anger by the afternoon, as police violently dispersed a weeklong student protest based in a Letpadan monastery. Students and Buddhist monks in Letpadan were indiscriminately kicked and struck with batons by police after the monastery protest site was stormed. During the violence, police attacked medical workers carting injured protesters into ambulances. “They beat us inside the ambulance from the back door,” said Zar Zar Tun of the Free Funeral Service Society (FFSS), which was dispensing medical aid to those caught in the affray. “Our staff shouted at them to stop. My leg was injured during the beating.” Kyaw Thu, the FFSS chairman, said that groups of injured protesters had been transported to hospital for treatment in two ambulances provided by the organization. Zar Zar Tun told The Irrawaddy that six men and two women were sent to hospital in the first ambulance, including one patient suffering from a severe head injury. The Irrawaddy has been unable to confirm the exact number of injured, believed to number at least 100 based on eyewitness reports. According to the Ministry of Information, 127 people were arrested in the crackdown, including 107 men and 20 women. 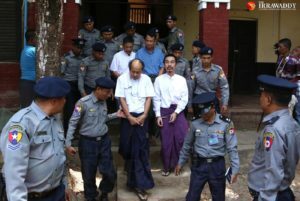 The Press Council has stated that journalists are among those arrested. Students initiated a hunger strike after being blocked from leaving Letpadan on Mar. 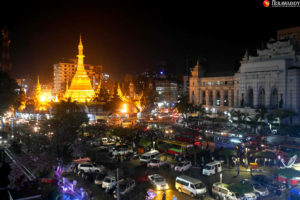 3, and on Monday attempted to bring the deadlock to an end by announcing a deadline of 10am the following day for authorities to allow their passage to Rangoon. 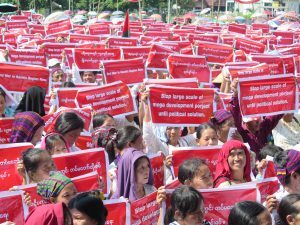 Intending to continue a march against the National Education Law, which began in Mandalay on Jan. 20, demonstrators were told minutes before the deadline expired that they would be allowed to continue. [irrawaddy_gallery] Soon, it became apparent that security forces intended to continue frustrating the students’ journey to Rangoon. 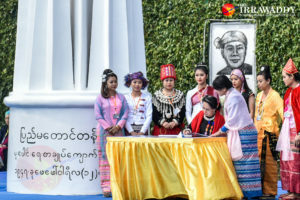 According to Dr Thein Lwin, a member of the National Network for Education Reform, protesters were told they would only be allowed to leave the monastery in groups of five at a time, and would be prevented from traveling from Rangoon as one group. 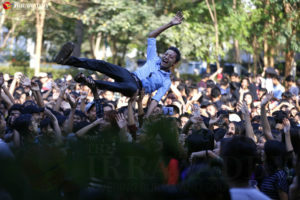 A conflict also arose over police attempts to prohibit the hoisting of flags emblazoned with the flying peacock, a longstanding national emblem of democracy and latterly a symbol of student calls for education reforms. “Students could not accept this,” he said. “They agreed to turn themselves in and asked to be arrested.” Shortly before midday, with the protesters still blockaded in the monastery, students and monks attempted to dismantle barbed-wire barricades and push through the police column, without success. After a second attempt to break the blockade an hour later, police loudspeakers announced the protest was unlawful, and began an assault on those inside the monastery. 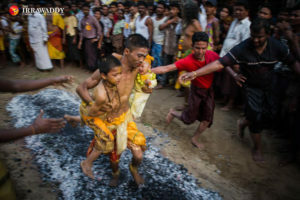 A photographer from The Irrawaddy characterized what followed on the ground as “a complete breakdown of police discipline”. The security forces, which greatly outnumbered the demonstrators, broke into two mobs. One group attempted to exercise restraint and the other indiscriminately attacking those trying to escape the violence. 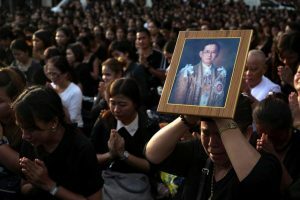 As students fled the scene, police stormed through the monastery’s buildings and nearby homes, dragging out protesters for arrest. Students found in the monastery were restrained with rope as police waited for trucks to carry them away. 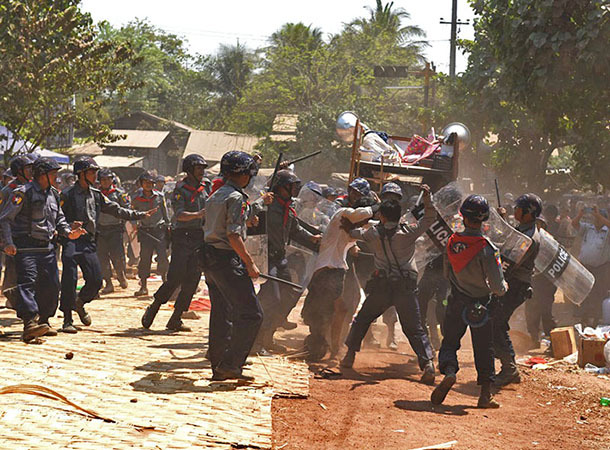 Students who attempted to turn themselves in peacefully were beaten by police, according to Thein Lwin. Reporters fled the scene as it became apparent that they were also unsafe from police attacks. Min Min, a supporter of the protest who came to Letpadan to document the confrontation, told The Irrawaddy that Union Daily reporter Maung Maung Myo had been beaten by police, and two other foreign journalists were harassed. 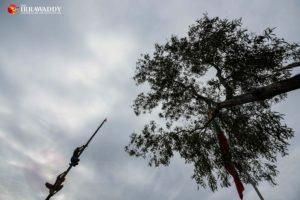 The mood among Letpadan locals, who had been largely supportive of the protesters, soon became rancorous as the crackdown continued. At about 3pm, police with riot shields formed a column across the main street and began moving towards a crowd of local residents gathered nearby, resulting in an exchange of insults and projectiles. The Ministry of Information released a statement on Tuesday afternoon saying that the police efforts to end the protest were in accordance with the law. 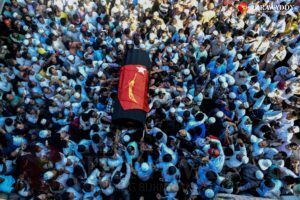 “Myanmar police forces blocked and controlled [the crowd] in accordance with the law,” the ministry said. “Protest groups moved and destroyed barriers, started to penetrate the blockade set up by police forces and threw stones at police members. 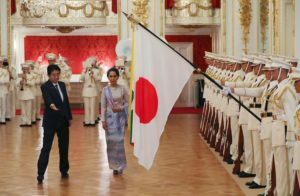 Police had to clear the crowd in accordance with the law.” Late on Tuesday afternoon, the Myanmar Press Council issued a statement condemning the arrest of reporters covering the incident. “Journalists neither supported, nor condemned, nor participated in the protest,” the statement read. “They reported what they saw. The Press Council sees the attack on the media and arrest of journalists as an act of police ignorance over the constitutional right of citizens and journalists… We seriously condemned the police force’s action and demand their immediate release.” Lawi Weng, Sai Zaw and Steve Tickner contributed reporting from Letpadan. 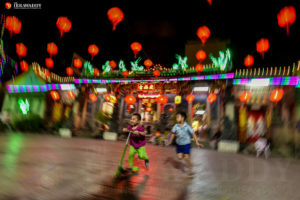 Kyaw Hsu Mon, Kyaw Phyo Tha, Yen Snaing and Sean Gleeson contributed reporting from Rangoon. Zarni Mann contributed reporting from Mandalay.